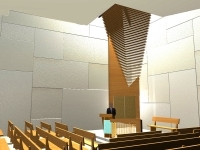 The Village Temple was designed to be the new home for a Reform congregation in the Greenwich Village neighborhood of Manhattan. The sanctuary creates an atmosphere of veneration through metaphor and light. Daylight pours in through the large skylight above the pulpit. The ark, which has been designed to represent the pillar of fire mentioned in the Old Testament, diffuses the light as it enters the sanctuary. Concealed skylights around the perimeter of the sanctuary give the impression that the roof is floating above the congregation like the divine presence while allowing light to cascade down the textured surface of the Jerusalem stone walls.